What's On Your Year End Planning Checklist? I just retired and my neighbor was telling me that her financial advisor always meets with her before the end of the year to go through her year end planning checklist. She said that missing something could end up costing you a lot of money. What’s on this checklist and what should I be worried about? While every financial advisor will have their own version of the year end planning checklist, the big three things you want to pay attention to as a retiree all have to do with your retirement savings accounts. The IRS says that once you turn 70 ½, you must take out your Required Minimum Distribution from your IRA. This only applies to traditional IRAs and not Roth accounts, however, it doesn’t matter whether you are retired or not. Once you hit that magic birthday of 70 ½, you must take out your required minimum amount, or you will be assessed a hefty 50 percent tax penalty. Year End Planning Checklist #2: Be Early! There is no rule that says you have to wait until the age 70 ½ to take out your IRA money. In many cases, accessing this money early can be part of a tax diversification strategy. If you are taking your RMD this year, be aware that many financial institutions have early due dates in preparation for the high volume of withdrawals, so don’t wait until the last minute. If your magic birthday happens to be this year, then happy birthday to you! – you are get a grace period until April first of 2016 to get your ducks in a row. Most people know they can’t withdraw the money from their IRA until the age of 59 ½ or they will be assessed a 10 percent penalty. If you retire early, however, the IRS has a special tax clause for you called the Rule 72(t). If you are retiring early and you have a Roth IRA, you can take distribution from your Roth in a series of equal payments, either monthly or annually, using your future life expectancy as established by IRS guidelines. The trick is, once you start taking these payments, you are locked into this schedule, and the penalty for forgetting just one time can cost you dearly. Be sure to consult with a financial professional before taking advantage of early withdrawal privileges. Bottom Line: Sit down and talk with a qualified financial advisor before you retire to make sure you are using the rules to your advantage. Now it’s your turn. We’d love to hear your questions about year end retirement planning. Leave them in the comments below and we will get them answered for you! Remember to share as much detail as possible in your question. Hundreds of RichLifers come here each week for insight and solutions. 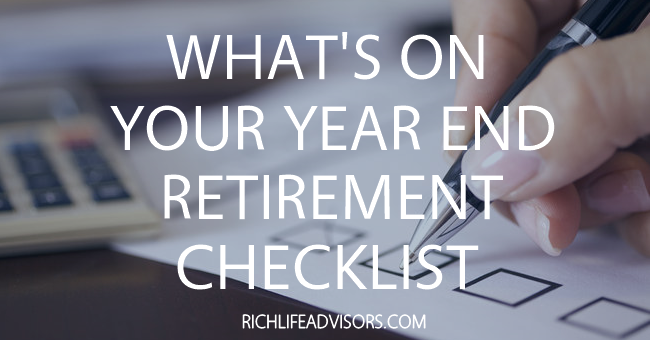 Your question may help someone else with their 2015 year end retirement planning. Have you checked out The RichLife Show on iTunes?